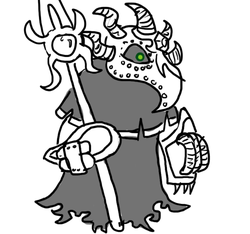 A powerful undead lich with impressive necromancy. He unlives on the island Hollowmarsh in a small village populated only by his risen minions. A generally nice guy to all but invaders, he makes comics in his spare time, of which he has a lot being immortal. He used to have a large army that both Lady Elegance and later Joyride were part of. But disbanded it for unknown reasons, retiring. The only known teacher of necromancy seen so far. He can manipulate bodies using a mixture of magic and machinery to create powerful unliving chimeras. His pressence in the world is well known, though in the form of fiction as Ol' Cloaky. He teaches Emerald Jewel the bone shaping ability. Emerald Jewel, nearly turned into an undead slave. Taught him a spell instead. Joyride, his former student and still current friend. Lady Elegance, his main assistant and bodyguard.